I love my dogs, its practically borderline insane how much I care for my two terriers, Oliver and Ella. I’ll forever be on 'Team Dogs' in the contest for the moniker of “Best Pets.” Sorry, not sorry, cat people! With so many brands stepping up the game in the world of dog accessories, its easy to go all out on giving your pooch’s style a much needed upgrade! Sebastian Says, a local Australian company specialising in bohemian inspired dog accessories, is made from quality materials that will stand the test of time and become your go-to brand for anything pooch-related. Read all about this local business & find out why you’ll soon be sporting one of their products on your next dog walk! Besides our shoes, belts, bracelets and wallets, we dont have a lot of options as men to add a final touch to our look that showcases our personality. Whether you like to stack a few bracelets together or keep it simple wearing just one, a bracelet is the easiest way to add some edge to your outfit without committing too much. Check out which are my three favorite brass bracelets after the link! I admit, I see the many pros on wearing a boat shoe. They're comfy, they're easy, they translate effortlessly from day to night, but lets face it, if you're over the age of 25 or you're not physically on a boat YOU SHOULD NOT BE WEARING A BOAT SHOE! Wait! Before you hit the X button on this post and say "you're ridiculous Gabriel" let me explain to you why. If you've been following my Instagram, you may have noticed I'm currently in the stage of growing out my hair. Can I admit something to you guys? The process has been hell! I have a slight obsession with shoes to be honest with you. I feel that they can make or break any outfit. Just like any other article of clothing, shoes come in so many styles for so many different types of usage. Because I'm out and about the majority of my day, I feel that my go to style of shoe is a solid sneaker. Sneakers aren't your garden variety of school-yard shoes anymore, they have been elevated by brands like Tom Ford, Maison Margiela & even Nike. The following three sneakers can carry you from start to end of the day. Each pair are stylish in their own unique way so don't be scared to be caught wearing them. My particular favorite? The paint splattered Maison Margiela sneakers. Which are yours? At one time or another we have all reached a point with our hair that it truly does not want to cooperate with us. Whether you’re growing it out, or simply cant be bothered fixing it, every guy understands that our hair sometimes can be our biggest enemy. While instinctively I reach for a ball cap at these moments, hats simply just wont do in certain occasions like the gym or while playing sports. Recently I purchased some Junk Headbands that have completely changed the game forever for me in sporting headwear. I used to think that headbands were relegated to chicks or 80s theme parties, but man has my opinion changed! I’m not exaggerating when I say that you’ll quickly become obsessed with this brand. Made out of moisture wicking material & breathable fabrics, Junk Headbands are built to withstand the toughest of workouts. Made in four different styles ranging from an infinity loop style to your traditional tied behind the head variation, these headbands have kept me looking sharp while exercising. What I enjoy the most is that they are designed in various prints & colors, making something so mundane into a must-have gym accessory. I currently have three that I constantly wear because my longer hair is making soccer impossible for me as I find myself pushing my hair back way too often. Check out this brand & let me know in the comments below what are some of your gym must-have items. Before I start today, I wanted to wish all of you guys a Happy New Year & apologize for slacking off during the holidays on the blog! I took the season to disconnect and put my Instagram, Twitter, Facebook & website on the back-burner & concentrate solely on being present in the moment with friends & family! New Year, new start I say! So get ready for an exciting year & promise you this will be the best one yet on the site! So over the holidays I saw a bunch of my friends either receive or gift themselves an Apple Watch. It really is no secret between my friends & I how much I’ve loved my watch since it launched last April, but my one gripe has always been its complete lack of individuality & pizazz. I know there are a multitude of colors & materials to choose from, but it really is hard to set yourself apart from the rest because chances are someone you know already has the same band. Because of this dilemma I set out to find a unique & luxurious band that would make me proud to sport my Apple Watch while at an event or dinner out on the town. I stumbled upon The Strap Smith a couple of months ago and immediately fell in love. Creating custom leather watch straps from authentic leather handbags from the likes of Gucci, Louis Vuitton & Goyard, it was easy to see that this was my solution to my gadget conundrum. Ultimately I chose a white LV Azur band with off white thread & a custom buckle. I was truly impressed how each band is hand made & stitched, meaning that the utmost attention to detail was used to create it. I highly recommend The Strap Smith to anyone out there looking for a unique & handmade band for their Apple Watch. What I have always loved about my iPhone is the aesthetic look to it. iPhones set themselves apart from other smartphones out there because of their design, so why would we cover them up with a bulky case? This has been my dilemma for years! No matter what case I chose, I always was bothered by how it masked my phones design & quite frankly made it look like a cheap plastic device. For the first time ever, I've personally been using a case that not only accentuates my phones design, but adds a personal, luxurious & modern look to it. For the past week I've been sporting a LuxBox case by theWTFactory on my phone. As the name implies, the case is truly a luxury accessory. Made in two luxurious material options, walnut wood veneer or 100% wool, this lightweight case just asks to be touched. What I enjoy most about the LuxBox case is how it adds minimal size to my phone while maintaining security. Usually a case with a thin rim equals low protection, but this case extends 1mm beyond the screen to protect the face of your phone in case of a drop. With a year long warranty, this case is a no brainer as the best solution to protect your iPhone. The LuxBox is the ultimate case in my opinion as it adds that special modern luxury style that we all love. Let me know in the comments below what you think of this amazing case! For a while now high-tops have dominated the casual shoe scene. Lately brands have been giving the high-top a bit of a refresh. Designed with bright colors & intricate detailing, trainers have become anything but your everyday shoe. With major brands like Tom Ford, Louis Vuitton, Givenchy & countless others designing some amazing high-tops, it is easy to see why high-tops have gone beyond the realm of basketball players & onto the feet of the fashion savvy. In my teens I opted to skip the Nike Air Force 1's trend, so I can't tell you that I've always been a fan of this certain style of shoe, but one sleek pair of Tom Ford high-tops later, I'm hooked on this trend! Dressing high-tops up or down is easy, they’re completely versatile. What I especially like about a good pair of high-tops is how they demand attention, every single time you wear them you are sure to be completed on your style. While some may say that designer high-tops are a waste of money I completely disagree. Like any other good shoe, spending the extra cash will ensure a quality product that will last a while. Since high-tops are like sneakers, you’ll be wearing them a lot more, so a great pair while last you longer than any Chuck Taylor’s. Check out my favorite picks of high-tops & leave me a comment below! Yeezus has arrived! 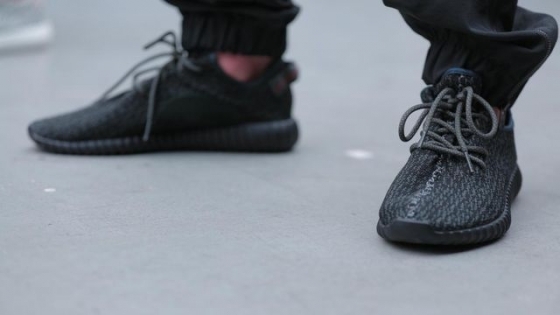 July 2015 was the month of the Yeezy. The highly coveted Yeezy Boost 350 sneaker by rapper & fashion guru, Kanye West, quickly became the most sought after sneaker of the season. I recently got my hands on this lust worthy sneaker. I can say that the wait to get my hands on them paid off, the sneaker is truly a gem. Constructed out of adidas' Primeknit technology, the sneaker fits like a glove, making the laces almost purely decorative. The touch of suede panels, with one of embossed with the letters YZY, give this sneaker a touch of elegance. If you weren't able to get your hands on the grey iteration earlier this moth, don't worry. Coming August 22nd the sneaker will be released again in black. Like before, they will be available at select stores. If you truly want to be on top of it, download the adidas Confirmed app to have it alert you when the new Yeezys will be open for reservations. Good luck!